in the course of the 19th and early 20th century. in touching the true authentic heart of Florence". to the illustrious figures who lived in Florence and are buried here. to lack of maintenance work. and preserved with the greatest possible attention. especially designed for the purpose”. promoted by ARTIGIANATO E PALAZZO will be successful”. will be given to the "MEMORIES OF RUSSIA IN FLORENCE"
between classical and contemporary art? How are the traditional artistic techniques used today? Are there any points where they overlap? 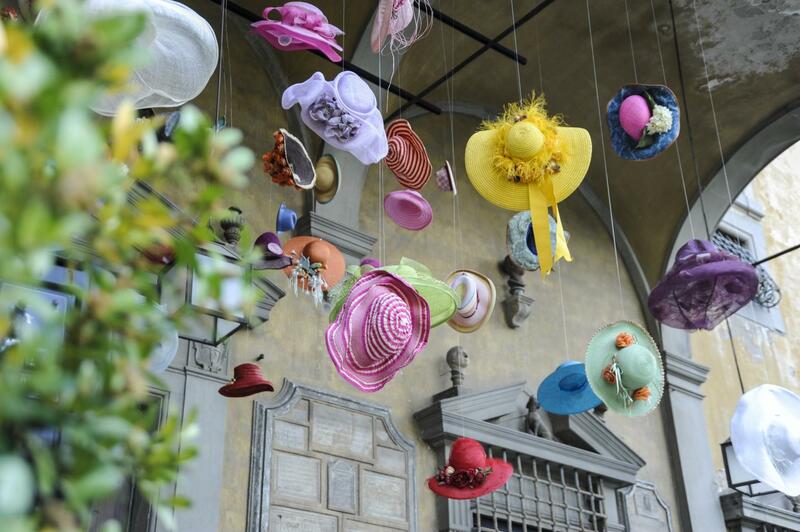 Consortium "Il Cappello di Firenze"
to produce a special collection of hats, drawing their inspiration from famous real and fictional figures of the Russian world. The exhibition-market ARTIGIANATO E PALAZZO was developed in Florence 25 years ago from a project by Giorgiana Corsini and Neri Torrigiani to promote, preserve and carry into the future, the age-old crafts and trades linked with Italian and foreign cultural traditions. “We wanted to convey the value of hand-made objects, by offering first-hand knowledge of the work of master artisans, in order to raise awareness that craftsmanship is one of Italy’s strengths and should be preserved, even in changing cultural and economic situations”. Promoted and organised by the non-profit cultural association Associazione Giardino Corsini, ARTIGIANATO E PALAZZO brings together a new selection of around 100 master artisans – from Italy and abroad – who work and recreate a scaled-down version of their workshops in the seventeenth century gardens of Palazzo Corsini designed by Gherardo Silvani, open to the public for four days from 16 to 19 May 2019. 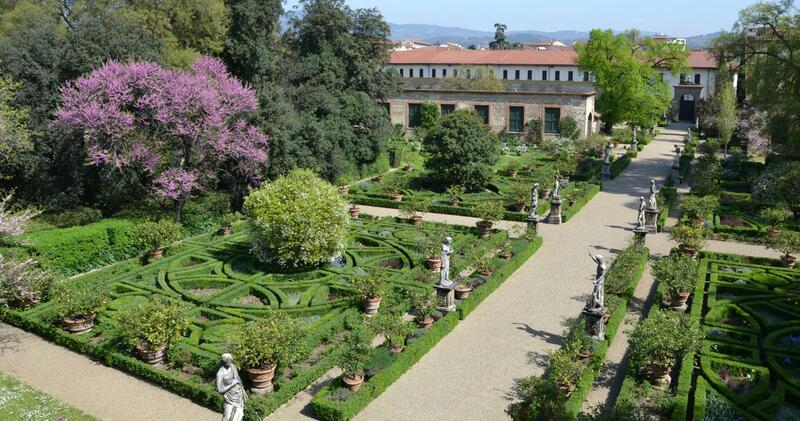 In this way, amidst the Limonaie (orangeries) and avenues with their geometrical shapes typical of the Italian-style garden, the artisans perform their arts live revealing the secrets of their hand-made arts, sometimes modernised by contemporary technologies and design. But that’s not all! 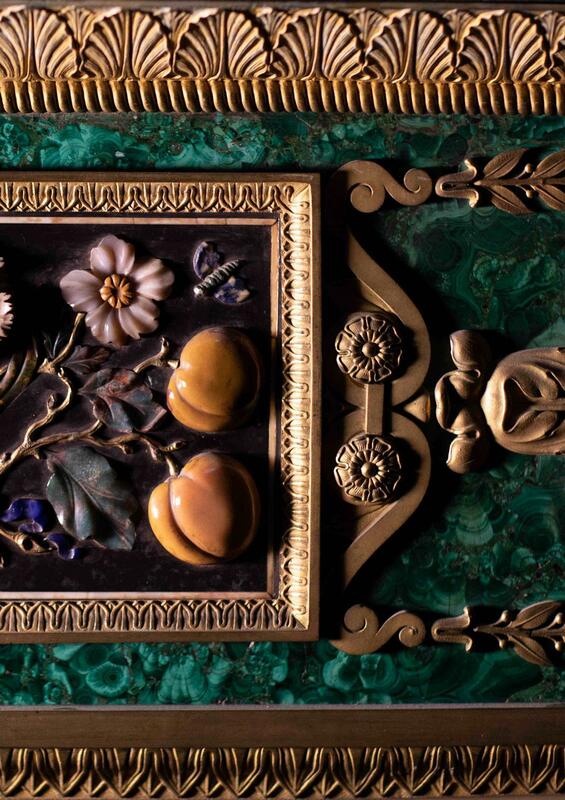 They also demonstrate the importance of choosing unique, original raw materials and of the attention to detail that makes each hand-crafted object an unrepeatable work of art. 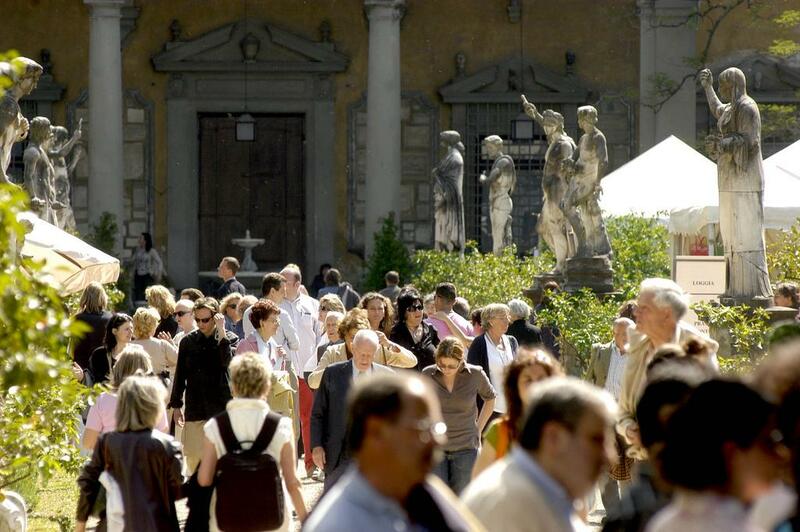 A campaign to promote the Florentine cultural heritage open to the public and the sponsoring businesses. In 2018, funds were raised to enable the reopening of the Manifattura Richard Ginori Porcelain Museum in Doccia. 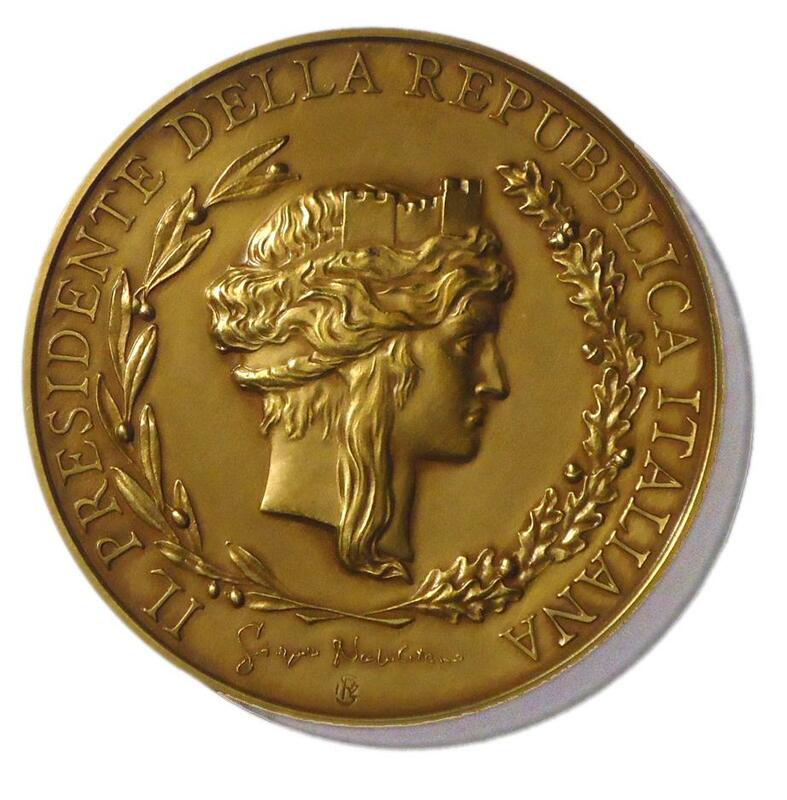 For the 25th edition, the campaign will be dedicated to the urgent restoration and preservation of some of the works of art dear to the Russian community which, throughout the 19th century and early 20 century embellished Florence with residences, churches and artistic collections (duration from 1 February to 31 May 2019). This exhibition is dedicated to the creative journey of an important Italian brand that has made craftsmanship the key to its international success. In previous years the exhibition has featured: Bulgari, Ente Tabacchi Italiano, Fabriano, Fondazione del Maggio Musicale Fiorentino, Gucci, Il Bisonte, Laguna B, Loretta Caponi, Officina Profumo-Farmaceutica di Santa Maria Novella, Richard Ginori, Roberto Capucci and Vacheron Constantin. A competition launched to promote the creativity of young people by combining “knowing how” with “knowing how to communicate”. The ten under-35 winning artisans, chosen from among the best talents for their capacity to innovate tradition with state-of-the-art techniques, will be guests at the event and will work and exhibit their creations in a Limonaia (orangerie) in the Giardino Corsini. At the same time, their works will be documented through live blogging by 10 of the best bloggers - experts on the themes of crafts, lifestyle, fashion, tourism – who will be offered accommodation during their stay in Florence by Starhotels. A daily event, sponsored by Richard Ginori, in cooperation with Desinare and Riccardo Barthel, which combines contemporary food culture with the traditional flavours and recipes of the past, amidst book presentations, live cooking and tastings. This year there will be international guests, famous chefs and cooks who will revamp some of the recipes linked to the Russian tradition. The Exhibition will also assign the Premio Perseo award to the exhibitor that the public liked best; and the Premio del Comitato Promotore (Promotion Committee Prize) will be awarded for the most interesting stand, and its owner will win a free stand for the 2020 edition of the Exhibition. In the past 24 editions ARTIGIANATO E PALAZZO has brought together 709 master artisans representing 151 artistic trades (pottery, glass incision, silver embossing, wood carving, tapestry conservation, gilding of frames and sculptures, stringed instrument-making, scagliola techniques, lathing, wickerwork, weaving, inlaying of semi-precious stones, goldsmithery, etc); 75 institutional partnerships; over 157,000 visitors. To promote the high quality of Made in Italy craftsmanship, ARTIGIANATO E PALAZZO has been invited to take part in important international exhibitions, among which Italy in Japan in Tokyo and Osaka, Artisans Passion in Paris and for the Year of Italian Culture the exhibition “Hats on Film/Il Cappello nel Cinema” was especially produced and held at the Italian Cultural Institute of Los Angeles. “ARTIGIANATO E PALAZZO: MEMORIES OF RUSSIA IN FLORENCE” is sponsored by Fondazione CR Firenze, Giusto Manetti Battiloro, The Nando and Elsa Peretti Foundation, Savio Firmino, Richard Ginori, Fondazione Ferragamo, Banca CR Firenze, Fondazione Cologni dei Mestieri d’Arte in cooperation with Starhotels, Desinare, Riccardo Barthel, Life Beyond Tourism, Maggio Musicale Fiorentino, Destination Florence Convention & Visitors Bureau, Alitalia, Amanda Tours and Source Self-Made Design. 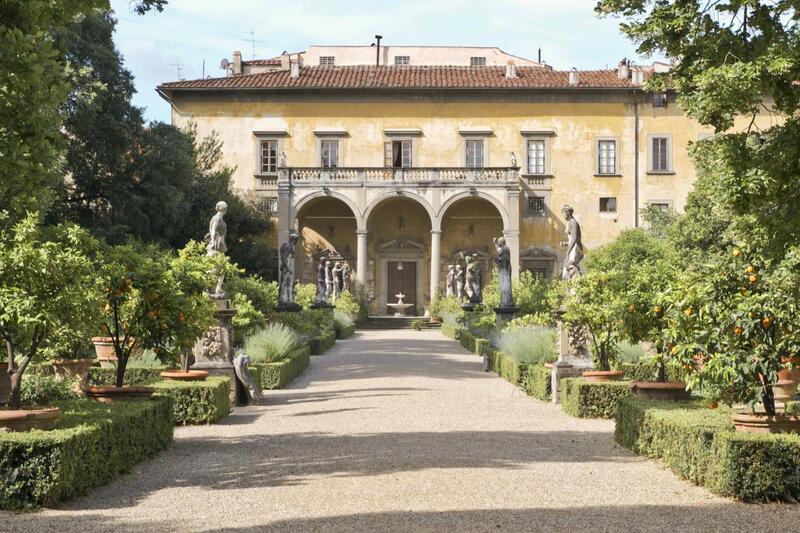 This edition marks the milestone of twenty-five years of the ARTIGIANATO E PALAZZO Exhibition (Giardino Corsini, Florence, 16-19 May), developed from a project by Giorgiana Corsini and Neri Torrigiani to promote, preserve and carry into the future the arts linked with the best Italian and foreign artisan traditions. But also, to create a network between those who practise their manual crafts with passion, giving them the opportunity to compare notes on skills, knowledge and resources. “For the 25th year of the Exhibition we wish to pay a tribute to the multicultural and international identity of our city by setting ourselves a challenge, as patrons of the arts, where history and modernity meet”. The target is to collect over €308,000,00 in order to be able to carry out urgent restoration and conservation works on the masterpieces of the Demidoff Collection housed in the Stibbert Museum; on the Hemicycle of the Evangelical Cemetery “agli Allori”; and to complete the restoration works on the Church of the Nativity of Christ and Saint Nicholas the Thaumaturge (the icons of St Andrew and John the Theologian, the large iron entrance door by the Officine Michelucci and the fresco of the Annunciation in the narthex). The organisers of ARTIGIANATO E PALAZZO, Giorgiana Corsini and Neri Torrigiani, have decided to offer some sculptures of the young Florentine artist Riccardo Prosperi - aka "Simafra" - and the donations collected for these works will be channelled into the fund-raising project: ten unique numbered pieces, presented in a special Catalogue, with an introduction by Natalia Parenko, Director of the St. Petersburg Art Academy in Florence. The exquisite two-leaved door leading to the upper church is finely carved in walnut, depicting stories from the Old Testament, by one of the most famous woodcarvers of the mid-19th century, Rinaldo Barbetti. With regard to the Church’s exterior, the multi-coloured majolica tiles of the Manifattura Cantagalli factory, with their characteristic “fish scale” shape, adorn its domes and the high stringcourses of its main façade. 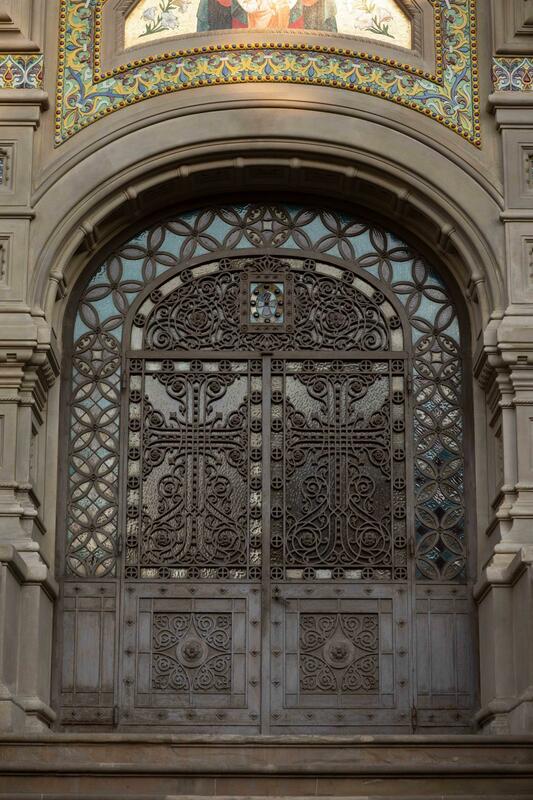 The iron crosses and the elaborate railings enclosing the grounds of the building, adorned with imperial eagles and the Florentine lily enshrining the Italo-Russian artistic partnership, is the work of the Fonderie Michelucci of Pistoia. The Russian Orthodox Church is one of the greatest manifestations of the Russian presence in the Tuscan regional capital and it is a historical monument under the protection of the Special Superintendency for the Historical and Artistic Heritage of the city of Florence which is responsible for the High Level Surveillance and Artistic Direction of the conservative restoration works of the architectural complex. (Florence, via Leone X, 8). Right from the outset of the nineteenth century, the art, society and mild climate of Florence and Tuscany exerted a great attraction on the Russian community, who chose this city and this area not only as a popular destination for leisure trips, but also for long regular stays, or even as a permanent place of residence. The Demidoff family, splendid hosts of Florentine society, first in the sumptuous villa of San Donato in Polverosa, then in the Medici villa of Pratolino, and in the spacious rooms of Palazzo Serristori, spent huge sums of money funding large projects for prestigious Florentine monuments, such as the façade of the Cathedral of Santa Maria del Fiore and that of the Basilica di Santa Croce. Florence rewarded their efforts by naming after them the square overlooking the River Arno, where the splendid monument of the Neoclassical sculptor Lorenzo Bartolini (1777-1850) stands. This was commissioned by the Demidoff children in commemoration of their father Prince Nikolai Demidoff, Tsar Alexander I’s ambassador to Florence. Leading figures of the arts such as Fyodor Dostoevsky, Pyotr Ilyich Tchaikovsky and Leo Tolstoy, - who, after having visited the city at an earlier date, appears to have returned to Florence in 1891 to take part in a conference on the possibility of melding the various Christian churches - stayed there during their travels in Europe. The same applies to a host of illustrious immigrées: writers Boris Zaytsev, Vasily Rozanov, Aleksey Tolstoy, Mikhail Osorgin, painters Karl Bryullov and Ivan Aivazovsky, the architect Vasily Stasov, the symbolist poet Aleksandr Blok and the art historian, Pavel Muratov. While in more recent times, the poet Joseph Brodsky and the film director Andrei Tarkovsky have paid tribute to the city through their works. A large community of anarchists such as Mikhail Bakunin – cousin of Sofia Besobrasoff, wife of Angelo de Gubernatis – and intellectuals in exile from all eras - such as the winner of the Nobel Peace Price Andrei Sakharov who was made an “Honorary Citizen” in 1989 - found in Florence a safe haven and a place to stay. In the field of poetry, Pyotr Vyazemsk of Pushkin's pleiade composed a lyric poem entitled Florencija the incipit of which is the introduction of Goethe’s Mignon's Song: [Do you know the land. There the Arno flows] The poem calls Florence the “fabulous city of Flora”. A garden of memory, one of the most crepuscular and alluring places of nineteenth century Florence, the “Agli Allori” cemetry was opened in 1878. It was designed by the architect Giuseppe Boccini, author, together with Michail Preobragenski, of the design for the Russian Orthodox Church. 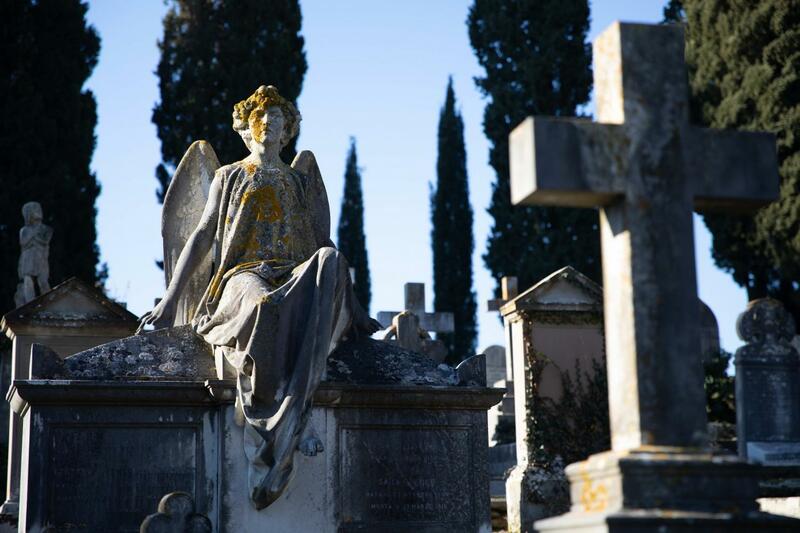 For the steadily increasing non-Catholic community of Florence, the cemetery was the continuation of the old so-called “English” cemetery in piazza Donatello, closed in 1877 when it could not be expanded due to the growth of the city. 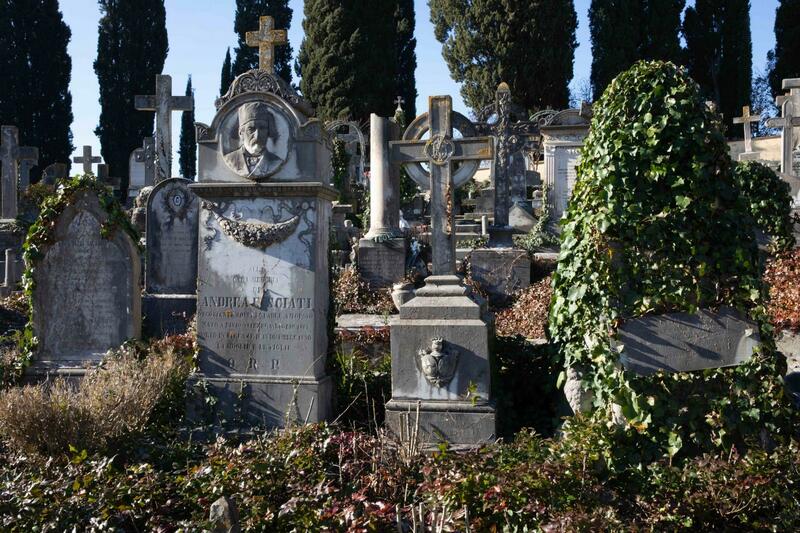 The continuation of the old cemetery was proof of the consolidated integration of the large international community that had settled in Florence. Taking advantage of the natural slope of the site, Giuseppe Boccini arranged the space of the cemetery in a tiered amphitheatre culminating, at the top, in a loggia with a strong visual impact, thanks to its two-tone brickwork, with pillars and arches made of sandstone blocks, against the backdrop of the surrounding cypress trees. Its seventeen arches appear as little chapels, framing the wall tombs housed by each of the arch spans. This architectural walkway displays some of the most impressive tombs of the cemetery: among which, at the centre, the Meyer di Montagliari chapel designed by Giacomo Roster and dedicated by Giovanni Meyer to his wife Anna Fitzgerald, who died young in 1884 and in whose memory the paediatric hospital was built in 1888.
n the tomb of the Rivioire family, executed by the Frilli workshop, the statue of an angel turns towards the closed marble door, symbolising the divide between earthly life and the afterlife. Nearby, in the monument of the De Filla family, the angel with its outspread wings, by Giuseppe Moretti, also refers to the theme of the threshold. A moving embossed figurative sculpture by Raffaello Romanelli in 1916 marks the burial place of various members of the Giarré family, of various origins and nationalities, embodying the cosmopolitanism of Florence. Alongside it is the plain and simple cross of the monument to a Russian princess, Olga Bachmeteva Basilevskaja, in memory of whom her son donated to the city of Florence the opulent villa where she had enjoyed the luxuries of a privileged existence, so that it could be used to alleviate the sufferings of the poor and the sick. In the Matthiesen tomb, designed by Fortunato Galli in 1908, a sorrowful statue with a veiled head stands in front of a walled aedicule with a pointed arch, its hand resting on an urn, draped with a pall. Underneath a large marble arch, a sarcophagus in the form of an altar, the front of which is decorated with small columns, houses the remains of the Countess Adele Watteville de Loins Michiel and her children. A pointed marble arch made of six slabs with two iron gates at the sides which lead the way to the burial ground below - following the modernised model of the Meyer chapel - is the burial place of the Jewish family of Molco Perugia and Luciana Marzia Corcos. Exquisitely simple the white marble sarcophagus with the wave decoration under the rounded arch within which the gravestones of the Spranger family are laid. This family, constructors of the industrial hub of Piombino, was of English origin. A sculptural group of intense pathos, executed by the Frilli workshop in 1922, portrays a young mother with three small children, dedicated to the young Nini Cobianchi Canobbio, who died at twenty-six years of age, after the birth of her third child. At the far end stand two simple altars, those of the Manzo and the Acton families. Sir Harold Acton, who died in 1994, the last of the Anglo-Florentines, donated his former home Villa La Pietra to New York University, along with the art collections gathered by the family from the beginning of the 20th century. Today this part of the cemetery in inaccessible due to its precarious structural conditions. The arched hemicycle with its stone pillars, cross vaulting and terracotta-covered wooden structure, requires maintenance work that needs to be very carefully evaluated. This state of disrepair is due, first and foremost, to the lack of timely and continuous maintenance work. The structural deterioration produced by the movement of the hilly ground causes critical problems in certain points, leading to serious instability. 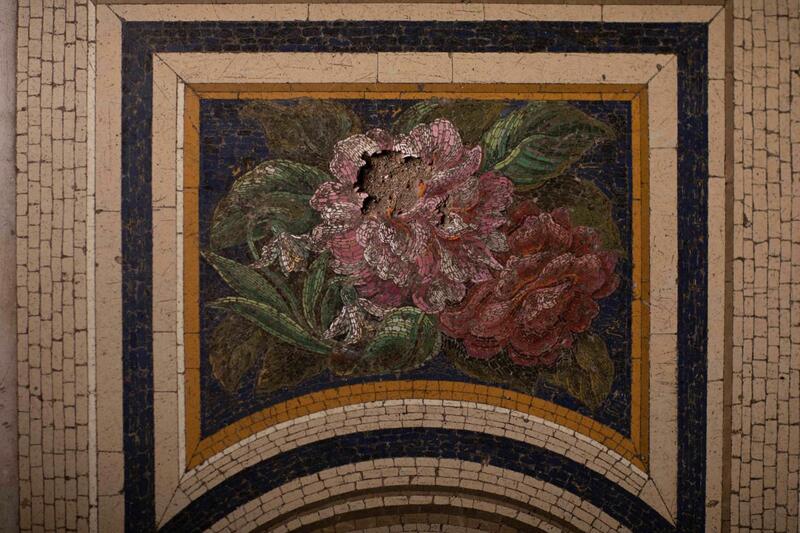 The exterior damage to the loggia corresponds to the unstable areas of the vaults. The covering also shows serious signs of disrepair, damaged by the weather and by the falling of some tall trees planted on the embankment above. The plaster facing of the facades is in a precarious state of repair, like many of the decorative stone elements on the frieze of the chapels. From this albeit brief description, the importance of the complex is evident, both in terms of its monumental value and as testimony to the illustrious figures who lived in Florence and are buried here. For these reasons the structure should be urgently restored and preserved with the greatest possible attention. 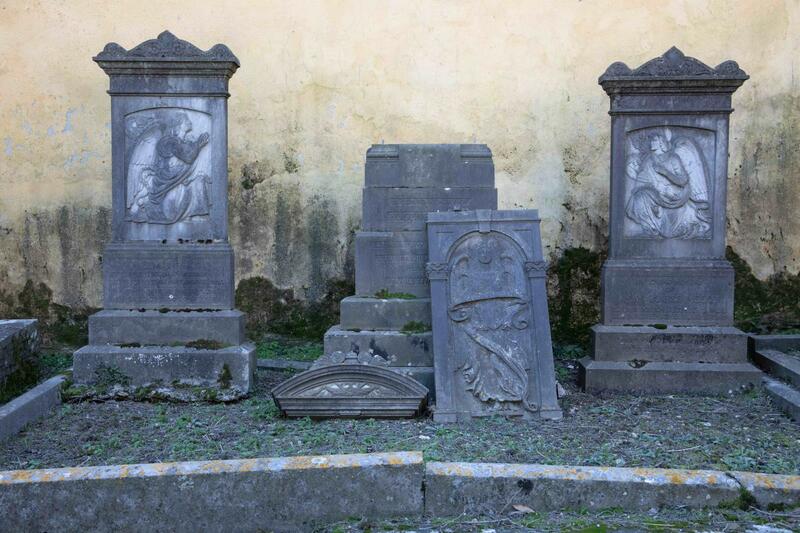 We therefore consider commendable the decision of ARTIGIANATO E PALAZZO to take action to restore this monument through a fund-raising campaign promoted for 2019. Fruit of the passion of its founder, Federick Stibbert, for seeking out works of art, the Stibbert Museum, with its wide variety of objects, armour and paintings, still houses today an important selection of furnishings originating from the Demidoff collections. The acquisition of works of art belonging to the famous collection of the princely Russian family came about during the auction, held in 1880, of the furnishings from the interior of the Villa of San Donato. On that occasion, Stibbert succeeded in obtaining the large malachite centre table decorated with gilt bronze statues, work of the celebrated Parisian bronze craftsman Charles Auguste, which, at the time of its transfer to Villa Stibbert, was restored by Luigi Corsini, the most renowned Florentine bronze craftsman of the time. 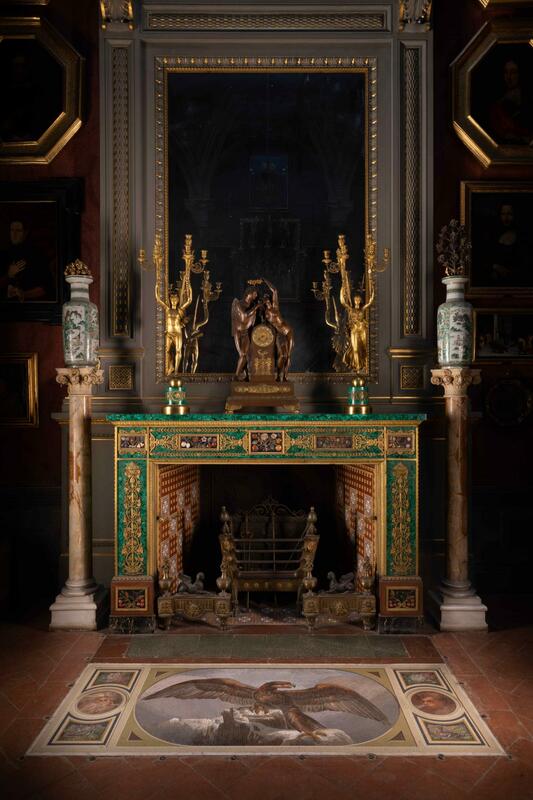 Also at the same auction, Frederick Stibbert purchased the impressive fireplace, also covered in malachite and decorated with semi-precious inset stones and gilt bronze statues, which was then fitted, together with its bronze andirons, in what was to become the Malachite Room, as though to render homage to the fortunate role of collectors that the Demidoff family had before him. It is here, in fact, that the aforementioned table is still to be found today, together with a light fitting, a pair of candelabras with antique figures that support the candle-holding branches and a minute mosaic portraying an eagle with outspread wings made by the Roman mosaicist, Michelangelo Barberi. 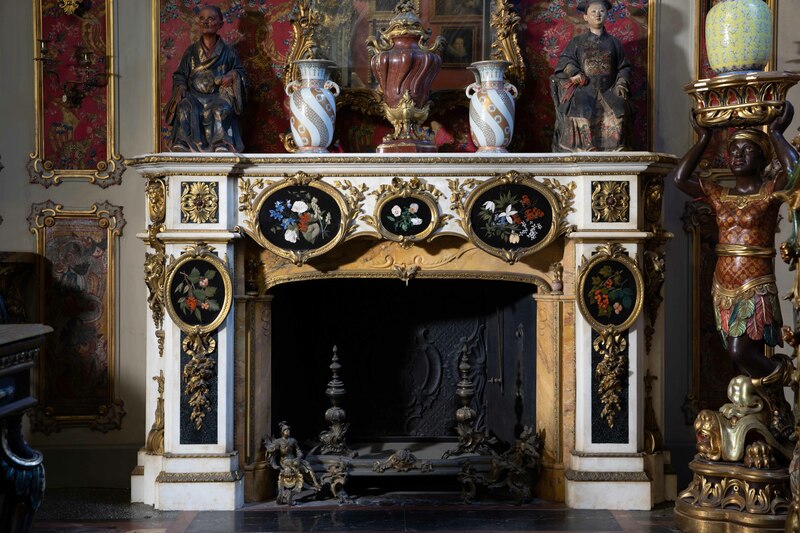 In the adjoining Louis XV parlour, a fireplace made of white Carrara marble with panels of semi-precious inset stones was installed. These panels were made in the workshop of the Grand Duke and then donated by the Grand Duke Leopold II to Anatolio Demidoff. No other museum in Europe possesses such an extraordinary selection of pieces from the Demidoff collections and this makes the Stibbert Museum a treasure chest of artistic marvels, the fruit of intelligent, refined Florentine nineteenth century collecting, a worthy heir to the magnificence of the Medici. The Russian Orthodox Church of Florence, built between 1899 and 1903 and dedicated to the Nativity of Christ and to St Nicholas is an architectural monument that is unique in Italy and Western Europe. It was, in fact, designed in the typically Russian style of Moscow’s 17th century Baroque churches, but incorporates various works of Tuscan artists and craftsmen, such as the glazed porcelain domes and friezes made by the Manifattura Cantagalli factory, the Crosses and railings by the Fonderie Michelucci foundry, the wooden two-leaved door of the upper church decorated by the master carver, Rinaldo Barbetti. 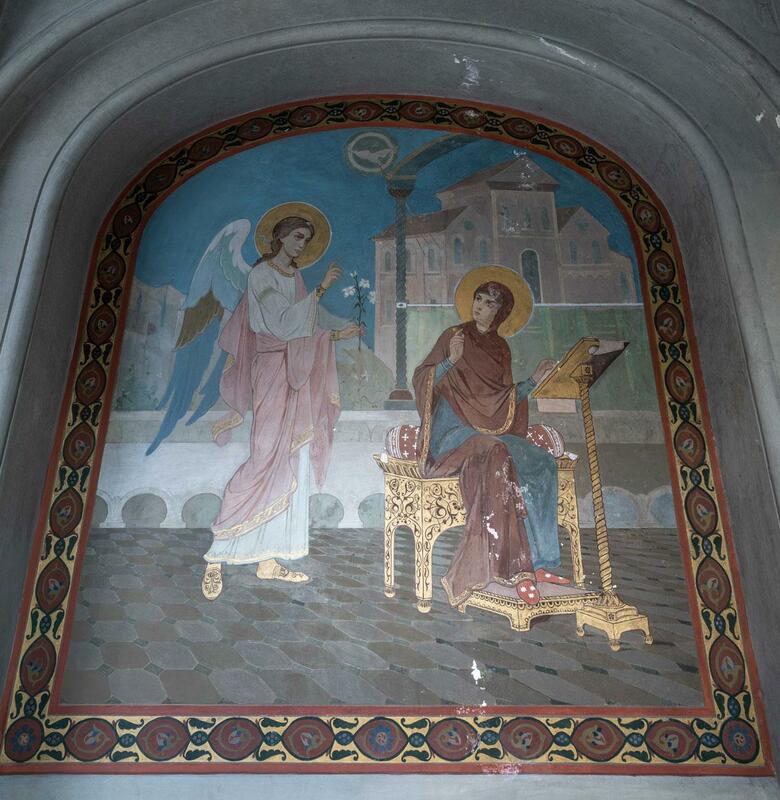 Although the author of the project, architect Michail Preobraženskij and those of the murals and icons were Russian, the workforce that executed the project was Italian, supervised by the architect Giuseppe Boccini. Well aware of the importance the Church could have in a city of art such as Florence, the promoters of the project - the parish priest, archpriest Vladimir Levitskiy, and the inspiring force behind the whole venture, Tsar Nicolas II himself, the Russian ambassador to Rome, Aleksej Nelidov, and a group of Russian aristocrats in Tuscany, among whom the Demidoff family - spared no expense in ensuring that the works were commissioned to the most highly qualified artists and craftsmen, and that the most precious materials were used. 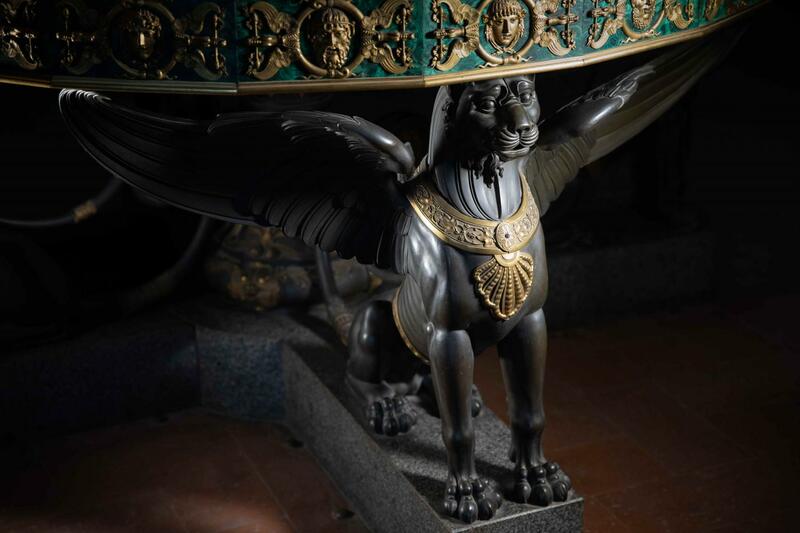 The Church has undergone several restoration operations over recent years, funded both by the offerings of its congregation and by contributions from the Italian Ministry of Cultural Heritage, the Fondazione Cassa di Risparmio di Firenze and private benefactors. At the moment there are still some restoration works to be finished inside the church, such as the fresco of the Annunciation, the large iron door of the narthex and two large icons portraying the Apostles Andrew and John the Theologian in the crypt, and we sincerely hope that this initiative promoted by ARTIGIANATO E PALAZZO will be successful. While maintaining its Russian identity, the Community is pleased to welcome Orthodox Christians from Florence and all over Tuscany, of all nationalities: Ukrainian, Moldovan, Belarusian, Kazakh, Georgian, Serbian, Bulgarian, Greek, offering spiritual comfort and support in a spirit of friendship and peace. Pavel Muratov, author of the most beautiful Russian writings on Florence, suggested to his fellow Russians to visit Florence in the month of May. His book Images of Italy, published a century ago, taught the Russians to love this city, so far away, in the long Soviet years during which it was impossible to visit. But finally, the regime collapsed and 30 years ago the author of these words found himself on the banks of the River Arno, in May. After a long, dark winter in St. Petersburg (at that time Leningrad, but it makes no difference), which is the penalty we have to pay for the ‘white nights’, seeing the “light-filled air” (Muratov) of Florence was an immense joy to behold. In Florence, a Russian experiences many things for the first time. The first Russian journey we have knowledge of was, indeed, to this city, for the Council of Florence of 1438-1439. And what a journey it was! Ecclesiastics in Eastern vestments, with an entourage of two hundred (!) people. The reunification of the Churches proved to be ephemeral, but the signatures of the Russian high prelates are visible on the final bull kept in the Laurentian Library. It was in the regional capital of Tuscany that the Russians came for the first time to actually live, and not just visit the city; in short, «all of Europe is only for looking, whereas Italy is for living» (Gogol’). The first ‘Russian Florentines’ in 1818 were the counts Buturlin, who left their coat of arms for us to remember them by, in via dei Servi. They were followed by the Demidovs, who at that time were probably the richest family in Russia, after the Romanovs. Soon the most exclusive Russian colony in Italy began to take shape. In no other Italian city were Russian fiancées so fashionable among the local aristocracy! As a result, many Florentine families married into Russian ones. 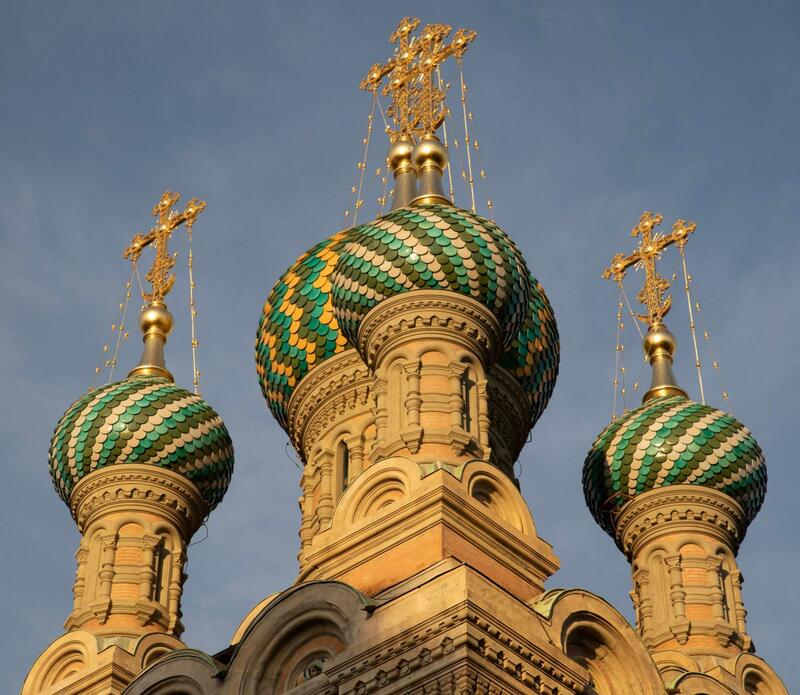 Thanks to the Russian colony and its refined tastes, the first Russian church in Italy was built; in other cities there were chapels, but the first real church was built here. Florence became a popular destination for painters, writers, musicians and people practising all kinds of artistic professions. For this reason, Florence has more commemorative plaques bearing Russian names than any other city: Tchaikovsky (his opera The Queen of Spades is considered a “Florentine” work), Dostoevsky, Tarkovsky. 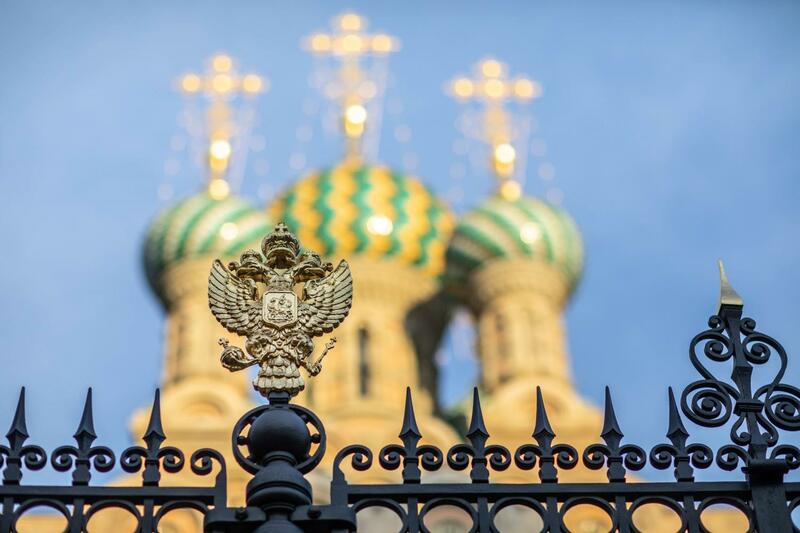 The banks of the River Arno set the scene for the fortunate encounter between two great cultures and this is why the founders of the Russian Church forged the image of the eternal union between the lily and the double-headed eagle on its great doors. Michail TALALAY was born in Leningrad, USSR, now St. Petersburg, Russia in 1956. Since the 1990s, after his first trips to Italy, his interests have been focused on the theme of Italo-Russian cultural relations, and he has done literary translations and historical research in this area. Since 1997 he has been a researcher at the Russian Academy of Science (doctoral thesis: The history of the Russian Orthodox communities in Italy) and he presented his final dissertation in May 2002. He is the author of 25 books and numerous articles in Russian and Italian. Since June 2003 he has been a scientific collaborator at the Institute of World History of the Russian Academy of Science (Moscow). He is also the Institute’s representative in Italy. “Some English people have arrived but II don’t know if they're German or Russian!”. The attitude of the Florentines towards the numerous foreign citizens who came and went in their city tended to be welcoming, if somewhat restrained and wary. The Russians, generally identified as “something else” due to their linguistic difficulties, remote provenance and the unfamiliarity of their customs, had become nonetheless - once “adopted” by the city - part of its everyday life, its history, its topography and its family trees. Already in 1439, with curiosity and wonder, Florence has watched the procession of the envoys of the Ecumenical Council. 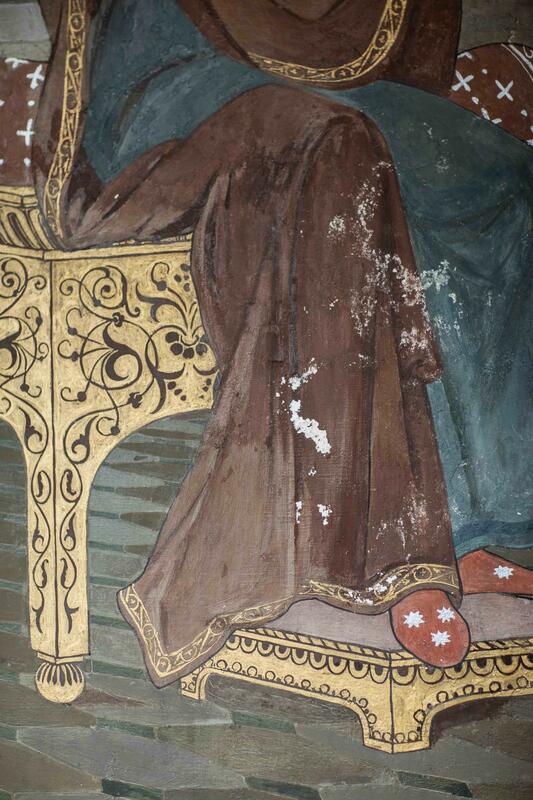 In the 1500s, Cosimo I followed by the entire genealogy of the Medici family up to Ferdinand II and then Gian Gastone had, with shrewd business acumen, traded for the ermine, sable, lynx and otter furs that they loved to don for their portraits, coloured mosaics of semi-precious stones, silk and gold fabrics, items much sought-after at the court of the Tsar. In the 17th century, the diplomatic missions that came from afar, such as those of Čemadanov e Lichačëv, who lodged at the Palazzo Pitti and the Palazzo Vecchio, still maintained, in the eyes of the Florentines, a certain exoticism and, like the age-old religious procession, aroused the curiosity of the population: “Dressing in the manner of their country, that is, in a semi-barbaric and rather strange way, they were always followed by a multitude of people who observed them, but to whom they paid no heed”. A new frontier of artists and architects but also a large group of craftsmen, decorators, scenographers, engravers, goldsmiths, not to mention minstrels and music, also from Tuscany, the court of Peter the Great opened its doors to Europe through that ‘window’ described in 1739 by Count Francesco Algarotti of Pisa, while the Florentine Accademia del Disegno welcomed the first young artists sent here for training in 1718-19. Less than a century later, the self-portraits of some of them, such as Orest Kiprensky or Karl Bryullov, were to make their entrance into the Vasari Corridor of the Uffizi, to join the Olympus of European art. During the period in which Italy had become a favourite destination of the Grand Tour, in Florence the doors of palaces, collections and workshops opened to the more emancipated representatives of the Petrine aristocracy as they travelled; the most important thing was to have a letter of introduction addressed to the Grand Duke, good letters of presentation and possibly substantial capital to invest in commissions to artists and craftsmen. From travelling to settling - this is how it happened for the most Florentine of all the Russians: the Demidov family, who marked the transition towards a new relationship in the 19th century. Nikolai had yet again aroused amazement with his collections, lifestyle and endless commissions but he narrowed the distance by gathering the Florentine citizens around him with his lavish benevolence. Then along the same lines, Anatoly, despite the watchful eye of the Grand Duke’s police, dazzled the Florentines with his ostentatious taste for extravagance. 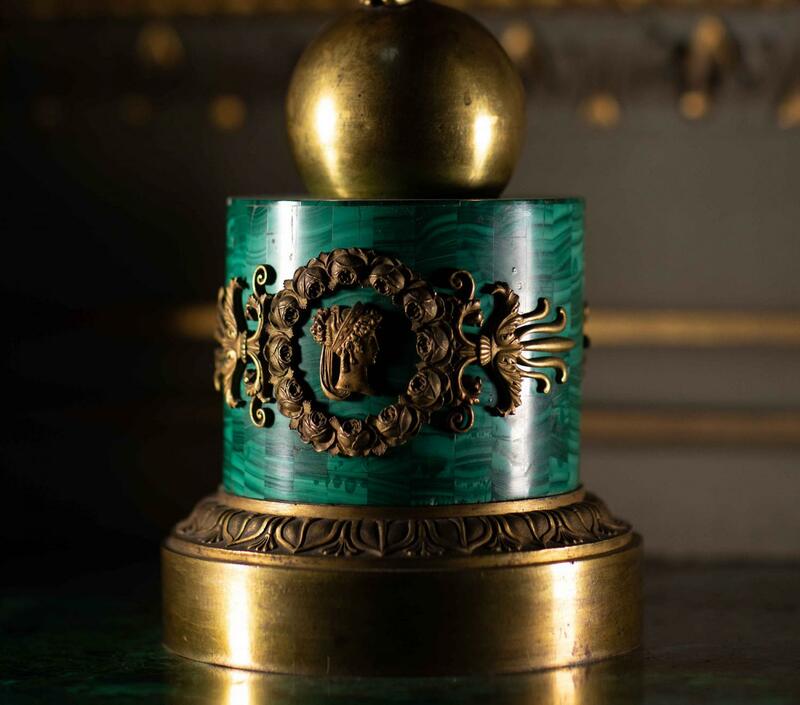 Precious objects, the magnificent colour of malachite combined with the gleam of gold, parties, horse races, the choice foods and sophisticated wines: the prince continued to fuel the show of luxury that possibly corresponded to the image that the Florentines had of the Russians. At the same time, in the course of the 19th century, Florence witnessed the growth of another phenomenon that took root and settled in the city, in a more everyday dimension, under the control of the diplomatic corps of the Tsar. This is described in its infinite domestic and social intrigues by Mikhail Buturlin, son of that Dmitry who, at the start of the 19th century had found fertile ground in Florence to reconstruct his library - destroyed in the fire of Moscow in 1812 - in a quiet salon. On the Florentine side, in the first quarter of the 19th century, a new drive in Europe to discover more about Russian culture, after the victory on Napoleon, prompted the journeys from Tuscany of Luigi Serristori, Giuseppe Pucci, Giovan Pietro Vieusseux, in search of new trade outlets. An attention that was extended and analysed in the pages of Vieusseux’s “Anthology” and in the famous Gabinetto Library. This is where the Russians, including Dostoevsky himself, would go to read books and newspapers with a freedom that they had never had in their own country. Then the Florentines began to go there too, in the second half of the century, to read the extraordinary Russian novels that told of a world that was not so far away after all. It was also Russia that had brought the ‘love novel’, in the real sense of the term, to Florentine life: It might have been Paolina Nencini, falling in love with Zachar Chitrovo, who started the Russian-Florentine dynasty of the Pandolfini. The ladies of the Buturlin family followed suit, followed by Lydia Bobrinsky, the sisters Zinaida and Varvara Naryškin, married Pucci and Ridofi, Drutskoy-Sokolinsky family with Zucchelli, Maria Kušeleva became the Marchioness Incontri, Sofia Bezobrazova the faithful muse of De Gubernatis, Lysina Rucellai who had become, in the eyes of the Florentines, an icon of the mysterious and fascinating Russian dame, and many more, at all social levels, giving rise to surprising love stories now for the most part enshrined in the memory of the cemetry “agli Allori”, at the gates of Florence. The domes of the Russian church, the first in Italy, greeted in 1903 in the pages of the Florentine newspaper “Nazione” with the words “warmest wishes for the prosperity of the Russian colony in Florence”, had created a unified image of that world in the eyes of the Florentines, identifying it with tradition, before the wave of the revolution brought here those who were fleeing and who found refuge in the lee of the church and in the inexhaustible generosity of Maria Demidov Abamelek-Lazarev. A world was ending, leaving behind a fairy-tale image of itself, symbolised by the sumptuous kokošnik (headdress) worn by Assia Olsuf’ev at her wedding in the Basilica di Santo Spirito in 1928. From the same lineage, Florence was then to gain new knowledge of just how much more Russian-Soviet literature had to offer, through the translations of Maria Olsuf’eva. In the meantime in the 1930s, the city was becoming acquainted with Russian music, scenography and ballet, with the founding of the “Maggio Musicale Fiorentino” festival, and it was totally enchanted. The conductor of the Stabile Orchestrale Fiorentina in 1932 was Stravinsky, while the baton and pen of Vittorio Gui revealed the L’anima slava nella musica moderna (the Slav soul of modern music) to the Florentines and to Italy as a whole. In consideration of this long relationship between Russia and Florence, in the period following the Second World War, its Mayor felt a pressing need to reopen a direct and courteous dialogue with the Kremlin, narrowing the gap that had been created in the difficult intervening years. This is the tradition celebrated by the ARTIGIANATO E PALAZZO Exhibition, in defence of its memory and in the hope of building new future occasions for cultural exchanges. Lucia Tonini, a university graduate in Russian language and literature, is specialised in 19th century and early 20th century Russian culture and art, with a special focus on travel literature and art collecting in the context of the relations between Russia and Italy. She has taught Russian art and literature at the “l’Orientale” University of Naples and is currently working at the University of Pisa. She has cooperated extensively with Gabinetto G.P. Vieusseux and is involved in research programmes and publications in Russia and Italy. For the 25th ARTIGIANATO E PALAZZO Exhibition, the organisers have decided to produce some sculptures of the young Florentine artist Riccardo Prosperi - aka "Simafra" - and the donations collected for these works will be given to the "MEMORIES OF RUSSIA IN FLORENCE" fund-raising campaign, promoted to help finance urgent restoration works on the artistic heritage linked to the existence, in 19th and early 20th century Florence, of numerous Russian communities. Ten unique numbered pieces, presented in a special Catalogue, with an introduction by Natalia Parenko, Director of the Saint Petersburg Academy of Art in Florence. 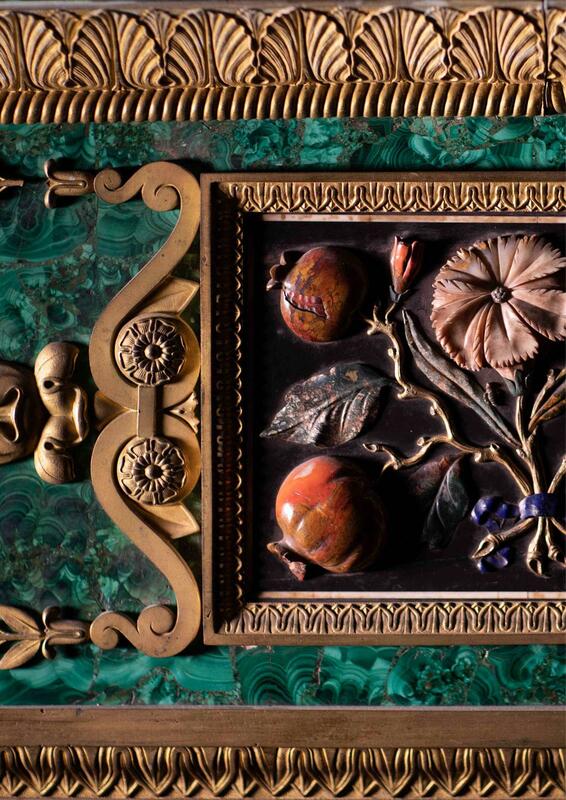 The spheres will be made of building materials and textures - externally the surface will be reminiscent of the Earth’s crust, with some linear, smooth areas - attributable to the malachite, ferrous black, gold, lava rock, and the exterior will be illuminated by the lustre of gold leaf. At a certain point - different every time - there will be a break, through which it will be possible to see the various cyclical transitions (Matryoshka effect) right through to a view of the inside of the smallest sphere: the core. The theme chosen by Simafra aims, therefore, to touch the essence/innermost part of each living thing: the lymph of a tree, the heart of a human, the core of the Earth, the foetus of a mother-to-be. With these 10 one-of-a-kinds - expressly conceived for the 25th ARTIGIANATO E PALAZZO Exhibition, for the "MEMORIES OF RUSSIA IN FLORENCE” fund-raising campaign, the artist interprets the theme of memory and Russia, from his own personal slant. - Design: Riccardo Prosperi aka "Simafra"
Riccardo Prosperi, known as Simafra, lives and works in Florence, the city where he was born. He started painting in 2000, working for a famous Florentine art restoration workshop, while studying with Prof. Ottavio Troiano. As of 2004, he started taking part in competitions and group exhibitions in Tuscany, and in the space of a few years he began to exhibit in Italy and abroad. Between 2008 and 2010, he lived in Paris and then in Germany, working with numerous galleries: in 2009, with Ken’s Art in Florence, the following year with Galerie Golkar in Bonn and Infantellina Contemporary in Berlin. In 2012 he took part in Art Arsenal, the international biennial in Kiev, and founded La Bottega Moderna in Florence, an independent cultural space which he also uses as his atelier. In 2013, he had regular engagements in London: here he took part in the group exhibition Odds & Sods at the Art Moor House gallery, after which he exhibited at the Cadogan Contemporary gallery. In the two years that followed, he began working with the Virginie Barrou Planquart gallery in Paris, and it was here that he had his first solo exhibition in Paris in March 2015. With this gallery he also participated in numerous fairs in Europe. In May of the same year, at the Palazzo Panichi in Pietrasanta, he presented his project Le Quattro Stagioni (the four seasons), four canvases of monumental dimensions, which were subsequently exhibited also in Florence, in the prestigious setting of the Palazzo Gianfigliazzi-Bonaparte. Since 2016 he has been working regularly with the Maddox Gallery of Mayfair in London and the Galleria Russo in Rome and Istanbul. In the same year, he also took part in the group exhibition Erranti Erotici Eretici, organised by the Fondazione Vacchi through the critic/curator Marco Tonelli, in the Castello di Grotti, Siena. Later he returned to Pietrasanta to exhibit at the Ex-Marmi gallery, which hosted his solo exhibition, Humus; still in 2016 he worked on his first site-specific installation, entitled Autostima and contributed to the group exhibition Ecosistemi at the Fondazione Biagiotti’s Progetto Arte in Florence. In 2017, he opened with Eden, his first solo exhibition in London, hosted in January by the Maddox Gallery. In May 2017, the artist presented a new series of works inspired by the four elements in the Galleria Russo in Rome, at his solo exhibition entitled Aequilibrium. In 2018, after a brief stay in Finland, the artist painted a series dedicated to Lapland, which is to become part of the prestigious “Alessandro Grassi” collection to be loaned to the Centro “Pecci“ of Prato. At the same time another two of his works are to be included in the group exhibition in the Kakslauttanen Art Gallery in Finland. In cooperation with the Galleria Russo in Rome, he will take part in “ArteFiera” in Bologna and “Art Verona”. He is to be contacted by the editorial offices of “Exibart” for selection for their book entitled “222 emerging artists worth investing in 2018”. The year 2019 sees him starting a new venture in the United States: through London’s “Maddox” Gallery, he will start exhibiting in the new gallery of Los Angeles. Over the course of his career, Simafra has gained the respect of many collectors and his works feature in prestigious national and international collections, such as those of: the Lebanese Minister of Finance, Diego della Valle at Palazzo Tod’s, the Vice-President of Volkswagen, the Prince of Qatar, as well as in the New York apartment of actress, Cameron Diaz, and the Ristorante Cipriani in Ibiza. What are the points in common between classical and contemporary art? Just to make an example, the works of Riccardo Prosperi - aka Simafra - an artist born among the workshops of Florentine craftsmen, illustrate a new relationship between the freedom of choice of the artistic material and the classical forms of image development. The great Italian artists of the Renaissance also used contrasting colours in their works and gold backgrounds, and they studied nature in depth, focusing on the subject of their work. The project "ARTIGIANATO E PALAZZO: MEMORIES OF RUSSIA IN FLORENCE" is devoted to the presence of Russian culture in Tuscany, and particularly in Florence, through the centuries. Creating an image linked to Russia is not an easy task for a young Italian artist. Riccardo Prosperi has chosen a number of “modern” materials for his project, such as cement, acrylic paints, polyurethane... It may be that a philosophical approach helped the artist to transform the image of the Russian mother - the matrioska - into a symbol of the source of all life, the planet Earth. Prosperi develops the idea of the birth of humanity in a way that shows it inseparable from its roots, the earth on which a person lives and dies. The partly open spheres within which the observer sees the nucleus of the planet, reveal the multiform nature and the fragility of life. The artist depicts many models of the earth, in order to remind the viewer of the dangers that threaten our planet on account of our barbarous attitude. 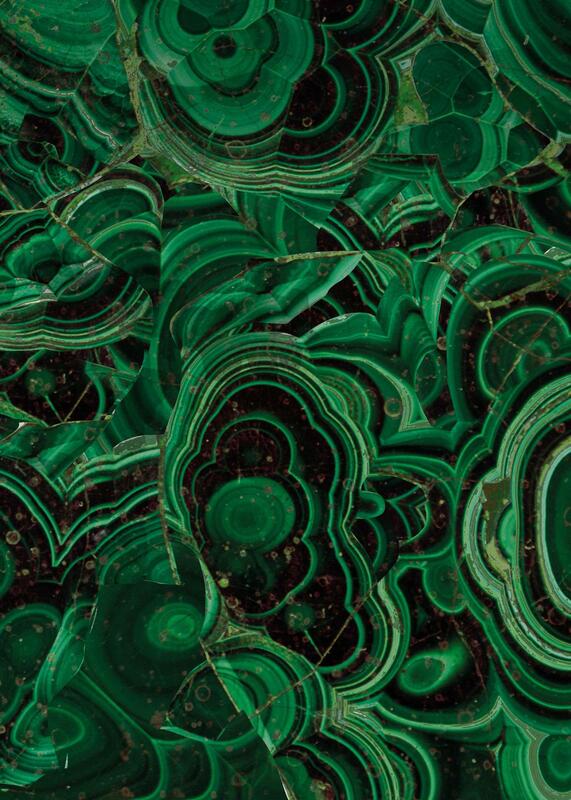 He reinforces the external image using the textures of malachite, a semi-precious gemstone mined in the Ural Mountains and very well-known in Russia. Gold is Simafra’s favourite material, however: when he applies it in sheets on the cement surface, it creates a unique sculptural relief, like incandescent lava vibrating on the surface of the Earth... As if, in the hands of the master, the entire planet could become a familiar, intimate story needing protective care and attention. Without a doubt, Riccardo Prosperi has learned the techniques of Renaissance art, having grown up in an extraordinary, culture-imbued environment such as only Florence can offer. The classical traditions of the use of gold with paints, the perfect shape of the circle, the spherical momentum of a spiral and its proportions, all serve as basic building blocks for the artist to develop his ideas. His contemporary view of art is an immediate reflection of the most urgent problems of humanity: the fragility of our planet, the unpredictability of human life, the artistic approach to the expression of a subject, the subject of the work of art itself and its constant embellishment, whether it be classical or contemporary. A Master who knows how to ply his art masterfully - who possesses the necessary skill to convey the meaning of a work of art to his spectator - does not contemplate any division between the academic and the contemporary approach to art. 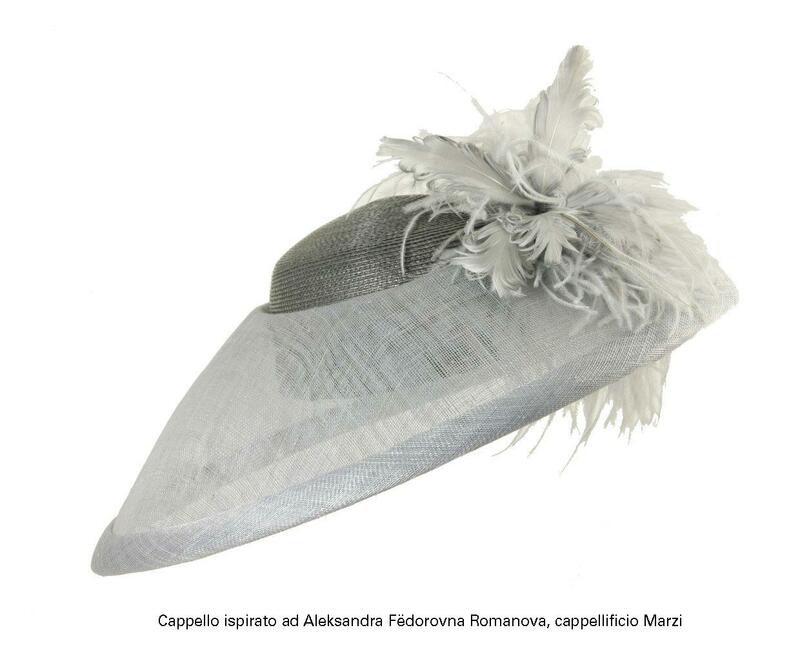 For the 25th ARTIGIANATO E PALAZZO Exhibition the organisers have suggested to the Consortium "Il Cappello di Firenze" – composed of the top enterprises of the Signa area which have been weaving straw and other typical materials since time immemorial - to produce a special collection of hats, drawing their inspiration from famous real and fictional figures of the Russian world. 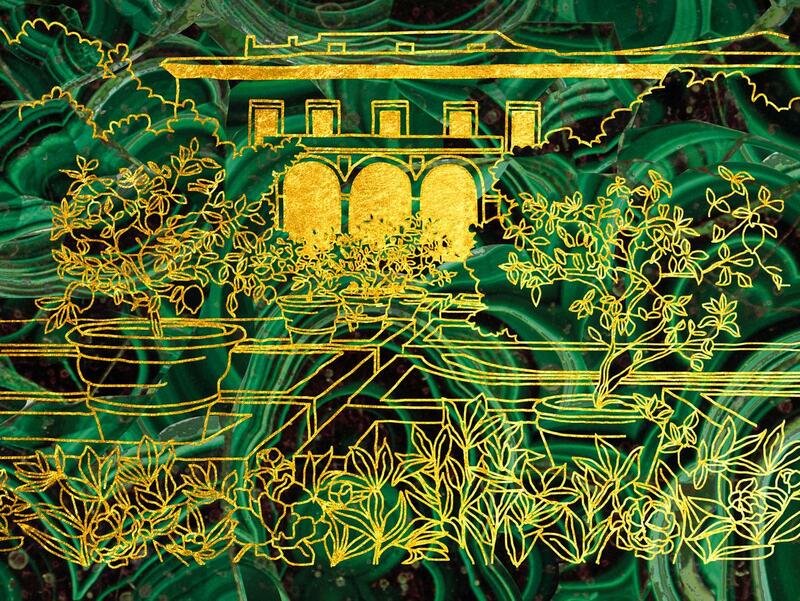 One hundred unique numbered pieces will be on exclusive display at the Giardino Corsini and the donations collected will be channelled into the "MEMORIES OF RUSSIA IN FLORENCE" fund-raising campaign, promoted to help finance urgent restoration works on the artistic heritage linked to the existence, in 19th and early 20th century Florence, of the numerous Russian community. The Consortium “Il Cappello di Firenze” was founded in 1986 under the umbrella of the Industrialists’ Association of the Province of Florence, in order to protect and safeguard Florence's age-old tradition of straw hat making, and promoting marketing and sale on international markets. It brings together the sector’s leading companies, heirs to a tradition that dates back to the 1700s and which is still going strong in the provinces of Florence, Prato and Pistoia. The members of the Consortium export to practically every country in the world, from the United States, to Europe, from Australia to Japan, and China. Grevi, Marzi, Angiolo Frasconi, Inverni, Memar, Facopel, Soprattutto…Cappelli, Raffaello Bettini, Tesi, Santelli Caterina Bertini, Talli, Alex, Rossomenta, Raw materials for hats Fratelli Reali, Ambuchi & Bandinelli, Trendintex. We appeal to the kind generosity of one and all! - a straw hat hand-crafted by the companies of the “Il Cappello” consortium of Florence, inspired by Russian literature’s greatest figures. - exclusive visit to the new site of the “Casamonti Collection” of contemporary art, in the company of the collector, Roberto Casamonti, patron of the Tornabuoni Arte galleries**.